Michael is Stefan's best friend. They grew up together in the castle like brothers, due to the fact that Michael's godparents, the king and queen, raised him. Stefan's father, King Mihai, shared a strong relationship with Michael's father, Viktor, before Viktor's death. Michael would do anything for Stefan. His loyalty is unwavering. Michael is faithful to the Sigmaringens for being surrogate parents to him, but he is anxious to forge a new life for himself now that he had come of age. Originally, when I was "writing" the book, I didn't see a bigger role for Michael until the end, when he succumbs to the fate that was meant for Stefan and the secret of his parentage comes out. James Franco was my orginal choice. Now, I've done a little recasting. 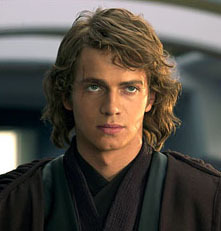 Hayden Christensen, best known for "Anakin Skywalker" in the Star Wars series is the new "Michael". My decision was simple. Hayden has the look that more closely resembles, Agim, Jon Hensley, (the new Mihai) and Julianne Moore. He can do dark and as Michael moves into a "darker" role, Hayden can easily follow him there, capturing the vulnerability the character needs and the darker side.